"Johnny Football" can now be called "Johnny Cleveland!" The polarizing playmaking QB out of Texas A&M is a former Heisman Trophy winner and is taking his talents to Cleveland! No sweat Browns fans, Johnny Cleveland is here to bring plenty of headlines to Cleveland! 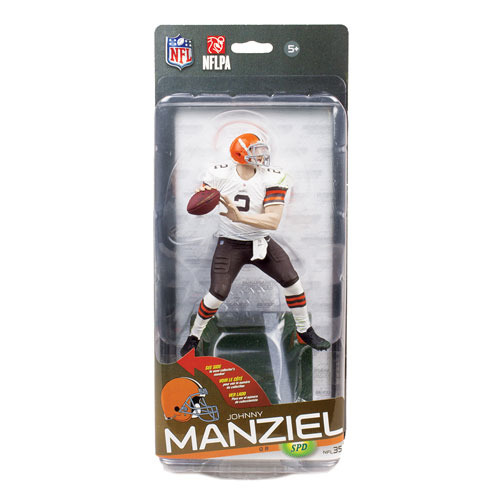 The NFL Series 35 Johnny Manziel Bronze Collector Level action figure stands 6-inches tall and comes in window box packaging. Johnny Manziel is ready to make a throw in his road Cleveland Browns jersey. Ages 5 and up.